My first visit to that place, I was on my bike. I took a train to that place first. Typical soviet-time grocery, now closed and abandoned, as it looks. If Tallinn were not so close then all these blocks would be only 2-3 storeyed. 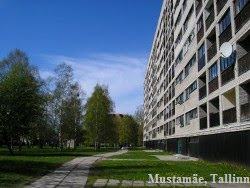 Lasnamäe has the same blocks. And another in the row, exactly the same. Yea, a field right next to this place, awesome! If there were the 5th floor, it would look like in Mustamäe in Tallinn! Or Väike-Õismäe in Tallinn. Going back to the centre. Back to the railway station and over. Ehh, I still had to go back to the centre, to eat something I think.